"The Vivandiere" History , Tradition, Uniform and Service . H. Sinclair Mills Jr., Published by CW Historicals, 1988, PO 113, Collingswood, NJ 08108.
" Women of the War" by Frank Moore, 1866 - Scranton & Co. [hard to find, check with antique book dealers. Time-Life Books, "The Civil War" (First Blood) pages 20-21. "Daughters of America or Women of the Century' by Phebe A Hanaford, True & Co, Augusta ME 1862. "My Story of the War" by Mary A. Livermore 1889- A.D.Worthington & Co., Hartford Conn.
Vol IX, #1 for July/August 1987, pg 25. Museum of the Confederacy in Richmond, VA. They have info on a very famous Vivandiere by the name of Lucy Ann Cox (13th Virginia) and other southern Vivandieres such as ( Sarah Taylor 1st Tenn.). 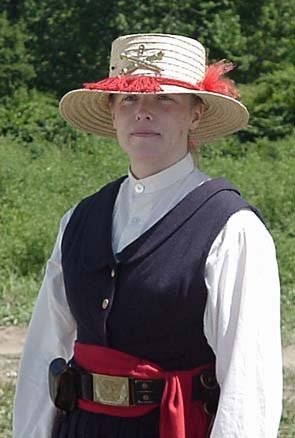 Marie "French Mary" Tepe marching with the 114th PA as known as Collis Zouaves, info collected from "Four Brothers in Blue" by Eugene Carter of the 8th US Infantry. Another source for this story on Mary Tepe is a newspaper clipping from the New York Sunday World dated April 18, 1897. Other daughters of the regiment include Kady Brownell(1st Rhode Island). Kady was one of the most famous. Madame Turchin (19th Illinois), Hannah Ewbank (7th Wisconsin Infantry.